What's happening to Australian equities? February has wrapped up another outstanding interim reporting season for the Hyperion portfolios. Despite the surprisingly upbeat re-rating of the broader market, there are signs that cost cutting is still cushioning earnings in the mining sector and the revaluation of yield stocks as a result of interest rate falls has created further downside risk in this low growth environment. The ability to deliver earnings growth will be the key driver of future long-term investment performance. Join Joel Gray, Portfolio Manager at Hyperion Asset Management for a 20 minute webinar to discuss how Hyperion’s portfolio companies have performed and the outlook for growth. At Hyperion we don’t spend a lot of time on macro related issues, but we do take note of conspicuous trends – such the steady exodus of investors reallocating to international stocks, attempting to capitalise on the falling Australian dollar and to escape the mining slow down. Forecasting currencies is a challenge few investors succeed at. At Hyperion our focus is identifying high calibre, quality growth opportunities. And for the majority of the Australian-listed businesses we hold, this includes significant exposure to internationally sourced, growing revenue streams. Clearly, the long-term correlation between the down-trending Australian Dollar and businesses exposed to global revenue streams is a plus for our portfolio. Join Tim Samway, Managing Director of Hyperion Asset Management for a 20 minute webinar. rather than speculating on currency moves. > Which high quality, globally competitive Australian businesses are expected to grow offshore revenue. More than ever Australian companies are growing beyond their borders as the magnitude of overseas-sourced revenue streams continues to grow. It is increasingly apparent that only the fittest, most innovative and culturally agile businesses can compete and thrive in this highly competitive environment. Hyperion’s Portfolio Manager Joel Gray has recently returned from a 3 week international research trip, where he undertook on-the-ground analysis of the overseas operations of Australian businesses, scoping of the competitive environment and assessment of disrupters and possible competitive threats to the holdings in Hyperion’s portfolios. Join Joel for this 30 minute webinar as he shares his findings and learn what the state of the global marketplace means for Hyperion’s portfolios and Australian companies in general. > The global threat - how at risk are Australian companies from offshore competitors and innovators? > Where growth opportunities lie for quality Australian companies? In excess of 90% of our alpha is generated around reporting season historically – clearly an important time for Hyperion’s portfolios and one when our process is put to the test. Learn more about what this reporting season tells us about the state of the market and what this means for the Hyperion portfolios looking forward, as Portfolio Manger Jason Orthman discusses the recent results in this live webinar. > Hyperion’s focus on predictability is put to the test – how did we fare? > What does a strong 2H mean in a long-term context? > Where do we expect growth come from now? And where won’t it come from? > Is online still the place to be? And where do we see the next great growth opportunities? The rise and fall of hyper-growth stocks with volatile (or even zero) earnings has done much to enhance the appeal of time honoured fundamental analysis and a strict definition of what constitutes a quality stock. Hyperion’s Portfolio Manager, Joel Gray, will discuss how to steer clear of the hype and the noise that can distort the true intrinsic outlook for a stock. > What sets some growth stocks apart from others? > What are the criteria for identifying quality growth stocks? > How to capture growth (and avoid the noise). > The outlook for earnings growth. > Knowing when to sell. Portfolio Manager Justin Woerner will discuss the recent Australian companies reporting season and what these results mean for our portfolios. 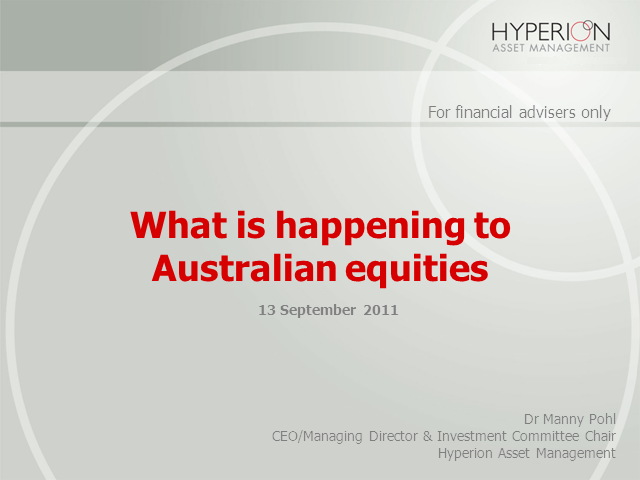 Hyperion Portfolio Manager, Joel Gray, will discuss the recent Australian companies reporting season. * What are the signs of returning corporate confidence? * Will the growth in online stocks continue? * How have sales, EPS & DPS contributed to growth in the market and Hyperion's portfolio? * How has Hyperion performed since reporting season? * Why did the long term intrinsic value of the portfolio drift higher through reporting season? Since the GFC mid and small cap stocks have under-performed their larger cap peers in the Australian equity market. So is now the right time for mid / small caps to out-perform? * Why have mid / small caps under performed large caps in the Australian equity market? * Some mid / small cap sectors & stocks have out-performed - which ones and why? * What attributes should investors look for in picking out-performing small / mid cap stocks? * What is Hyperion looking for in the upcoming companies reporting season? * What is the long-term outlook for mid / small companies? Tim Samway – Managing Director, Hyperion Asset Management; Adrian Whittingham – Director, Pinnacle Investment Management. Recorded at a series of national lunches, Hyperion Asset Management’s Managing Director Tim Samway discusses a number of key indicators that suggest investors have made a fundamental shift towards greed, or perhaps hope. Title: What's happening to Australian equities?